It’s no secret that I adore Japanese cooking. I mean, what’s not to like? Japanese dishes are for the most part, fairly healthy, fast and easy, and super flavorful. Plus, you get to use chopsticks and put everything in cute bowls. Don’t even get me started on the little condiment dishes and soup spoons. So, when I saw this recipe for Soboro Don in one of my favorite cookbooks, My Japanese Table by Debra Samuels, I couldn’t wait to make it. I may have even gotten a little excited, as in scare the children excited. When you spend your days with a 3-year-old, these kinds of things can happen. Sorboro means crumbled, seasoned meat or fish in Japanese and Don is an abbreviation of Donburi, which means bowl. 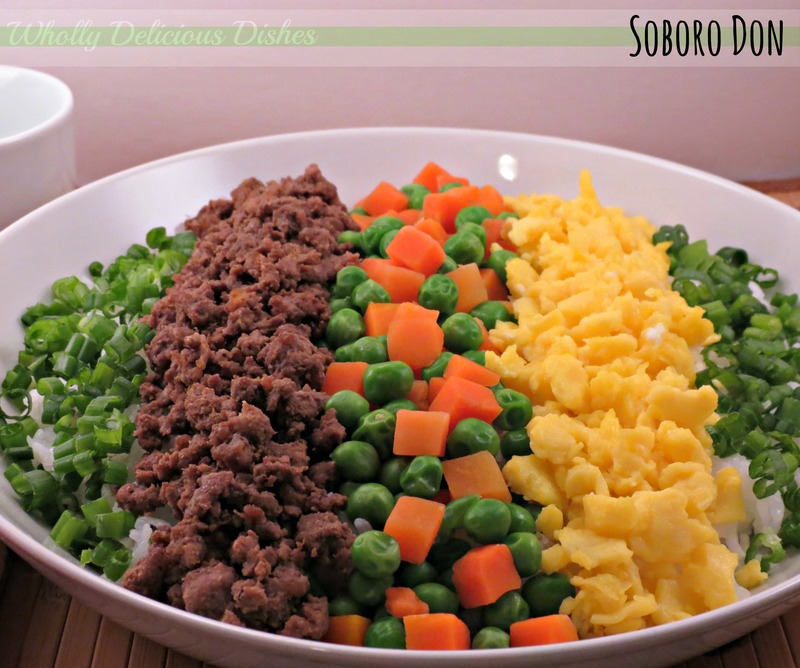 Soboro Don is basically a rice bowl with seasoned ground meat. Simple, but oh so tasty. This particular Donburi uses color as a focal point. Brown, yellow and green. I used ground beef to represent brown, eggs for the yellow and peas and green onion, for the green element. You can use any type of topping you wish when making your donburi bowl. The possibilities are endless. You can read more about the different types of traditional donburi bowls, here. This Soboro Don literally took minutes to put together. I prepared the eggs and beef while the rice was cooking and microwaved the frozen peas and carrots. It doesn’t get much easier. You can use any type of rice you like. Just cook it according to the directions on the package. 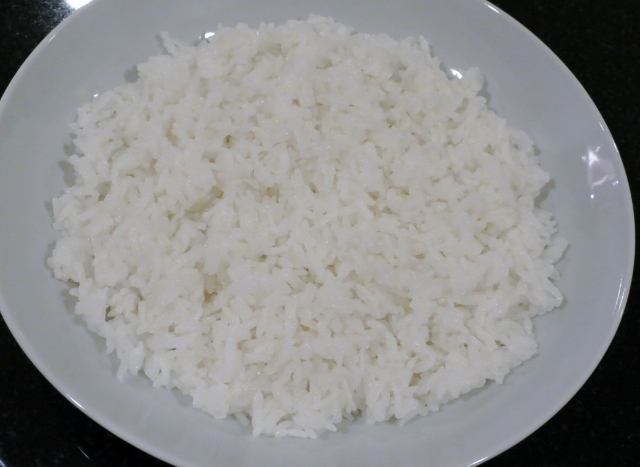 I chose white rice and used my rice cooker to prepare it. Do you need a super speedy dinner? Try this method for cooking rice in the microwave. It will cut your cooking time in half. I don’t know about you, but for me, this is a big deal. Definitely on my list of awesome things I must do in the kitchen. Brown the beef in a skillet over medium-high heat. Drain it, then add the soy sauce and seasonings. Stir in the hoisin or teriyaki sauce and set aside. Heat a skillet over medium-low heat. Beat the eggs with the sugar and salt. I substituted the sugar for a stevia packet. Pour the eggs into the skillet and stir, breaking them into tiny little bits, until cooked through. If you want to be one of the cook kids, you can use chopsticks to do this. If you don’t have chopsticks, use a spoon and tell everyone you used chopsticks. To assemble the Soboro Don, get all your ingredients together in an assembly line and grab a large bowl. Spread the rice into the bowl in an even layer. 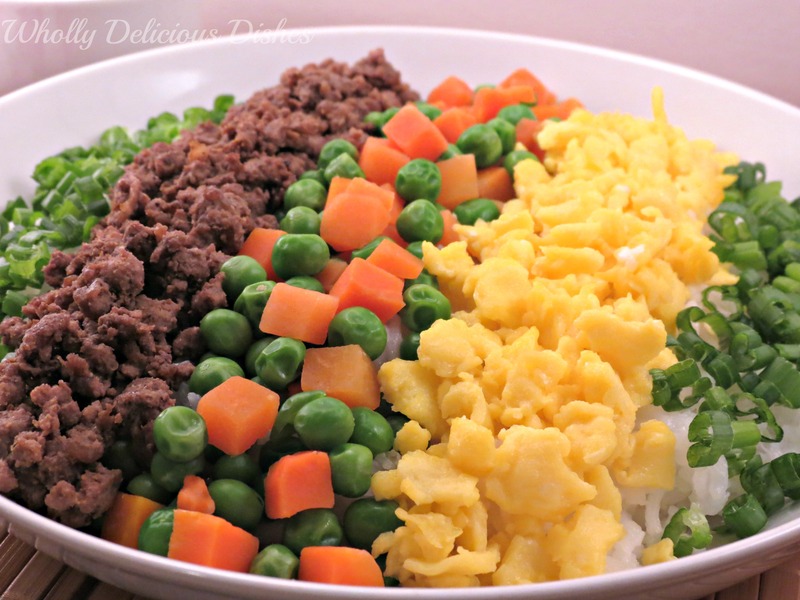 Arrange the meat, eggs, peas and carrots and green onions in lines on top of the rice. Gorgeous. 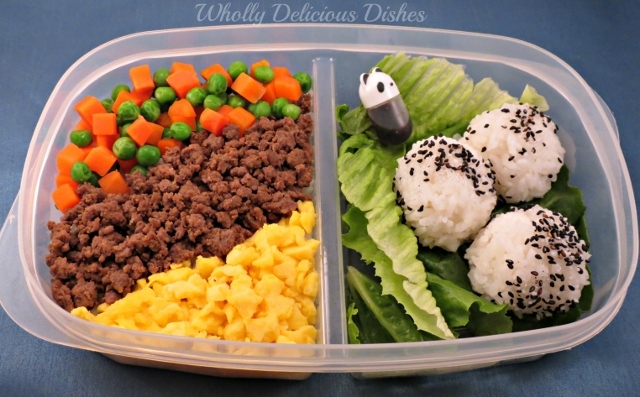 If you have any leftovers, they make the best Soboro Bento lunch the next day. A Japanese style rice bowl, topped with seasoned meat, eggs and vegetables. Brown the meat in a large skillet over medium-high heat, breaking up the meat with the back of a spoon into very small crumbles. 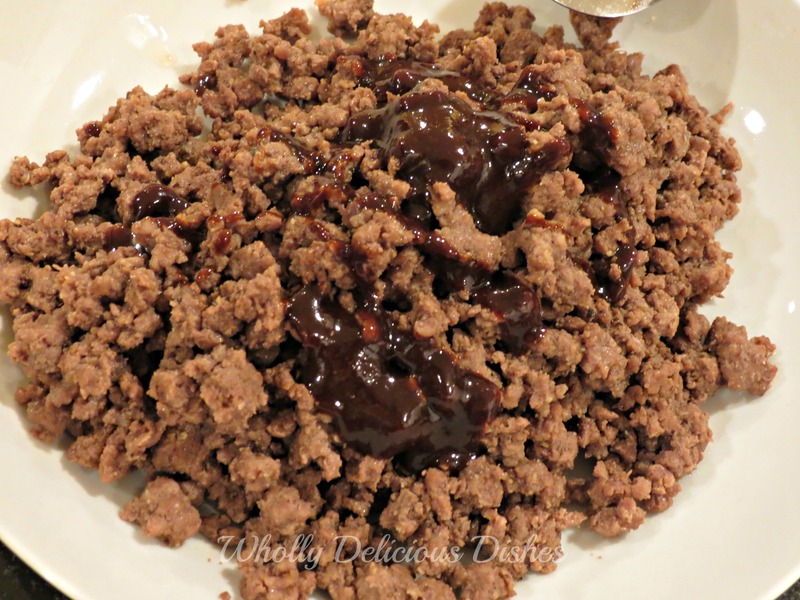 Drain the grease, then add the soy sauce, onion and garlic powder, pepper and hoisin or teriyaki sauce. Set aside. Heat a non-stick skillet over medium-low heat. Beat the eggs with the sugar and salt. Pour the eggs into the skillet and stir with chopsticks or a spoon, to create small bits, until cooked through. Remove from heat and set aside. Steam the peas and carrots until they are cooked through but still firm. Season with salt and pepper to taste. Set aside. 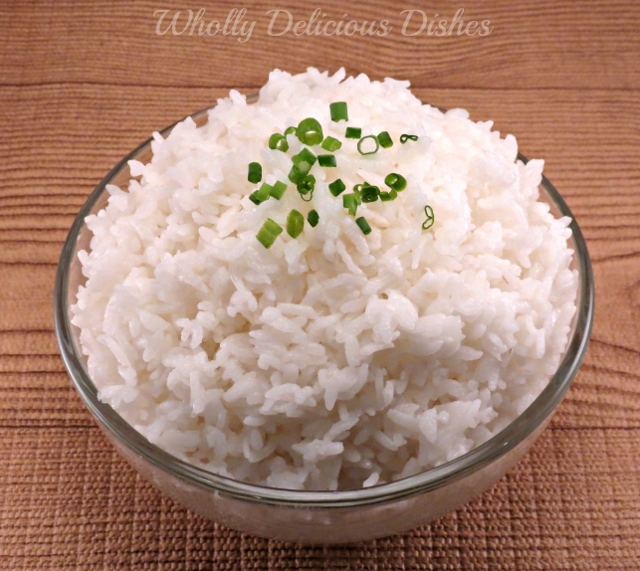 Place the rice in an even layer in a large bowl. Form lines with the meat, eggs, peas and carrots and green onions on top of the rice. Hi Erin! Yes, 7 is an interesting age! My son loves Japanese food. I bet he would love this recipe! Thanks for following my blog. I am following you too now via Google! Japanese food is the best. Thanks for stopping by and for the follow Theresa!